Zen Bakery Fiber Cakes have been a favorite of die-hard fiber-freaks for years. The Apple Cranberry ones are muffin-esque, dense (and delicious) little critters bursting with sweet cranberries and chunks of apple. These cakes look tiny, but they're really filling and an AWESOME mid-morning snack. Find 'em at Trader Joes, Whole Foods, or click here to scout out other locations. Peanut butter cookies are quite the indulgence. But pack 'em with fiber, keep the calorie count down, and suddenly you have the perfect excuse to chew 'em. 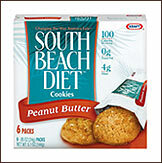 Thank you, South Beach Diet, for creating this AWESOME 2-cookie pack that promises to pummel any and all peanut butter cravings for 100 measly calories. Find these crunchy ROCKIN' snacks in the cookie aisle at your local market. Find it hard to pass up a new bar without checking it out? (We mean SNACK bars, not your local watering holes!) You HAVE TO try this delicious cereal-inspired treat from Kellogg's. It's like the love child of a chewy oatmeal raisin cookie and a yummy Rice Krispies Treat, and itll totally satisfy your sweet tooth while hookin' you up with 20% of your daily fiber needs. All-Bran is NOT just for grandma anymore. We promise. Find these at your local market. We've mentioned these bagels before but we'll say it again; Alternative Bagels are AWESOME. They're chewy, doughy and delicious (basically everything you'd ever want in a bagel), they only have 110 calories, and they're JAM-PACKED with fiber. The stats on these things are almost too good to be true. They come in a slew of awesome flavors, but we're singling out the blueberry ones now 'cuz they're the newest -- and they're also sweet and yummy. These bagels are available at select stores and can also be ordered online. Today, September 28th, is National Strawberry Cream Pie Day. Cut up some fresh strawberries, drizzle 'em with some Torani Sugar Free Strawberry Syrup and top with Fat Free Reddi-wip. Who needs an actual pie?